Is it ever appropriate to diagnose and treat oral and dental problems without knowing the full extent of the problem? With more than 50% of anatomical structures and associated pathologies located below the gingivae and unseen to the eye, thats the reality without the use of high-quality, accurately interpreted radiographs. 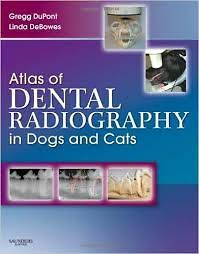 Atlas of Dental Radiography in Dogs and Cats presents hundreds of actual radiographic images, which are clearly labeled to facilitate accurate identification of normal and abnormal features. This valuable new atlas shows you exactly how to correlate common dental conditions with radiographic signs. Radiographs are also compared side by side with actual anatomical photographs to confirm surface landmarks visible on the radiographs. Correct positioning techniques for producing diagnostic radiographs as well as helpful tips and pitfalls when obtaining quality radiographs are logically presented. This approach helps you produce consistently high-quality radiographs, sharpen your interpretive skills, and confidently treat a wide range of dental problems.